The gallery shows a selection of sundials and sundial activities. 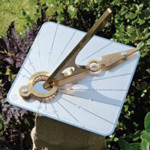 You can see details of our range of sundial designs and sundial services on other pages. 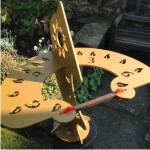 Please contact us to enquire about a sundial commission or restoration. 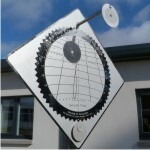 Dihelion double sundial in sculpture garden at Caol Ruadh, Argyll, Scotland. Scottish Sculpture Park. June – September (ticket entry). Single sundial. Caol Ruadh, Colintraive, PA22 3AR Argyll. Telephone 01700 841357. Inverewe Garden. January – December (ticket entry). Single sundial. National Trust for Scotland, Poolewe, IV22 2LG Ross-shire. Telephone 0844 493 2225. Lost Gallery. January – December (free entry). Single sundial. Strathdon, AB36 8UJ Aberdeenshire. Telephone 019756 51287. Before making a special journey do check with venues about opening hours and dates. 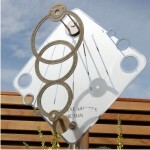 Please contact us at any time for information on which sundial designs will be on show. 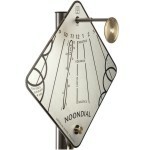 If there is one sundial you would like to see we will help you if we can. 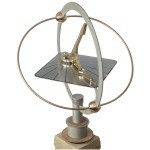 The full range of sundials and a selection of pedestals all by Macmillan Hunter are on show. 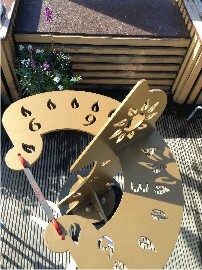 The new Dihelion sundial casts its appealing shadow showing the time in sunshine. A dual shadow also marks the equinox and solstice seasons of the year. Damhead Nursery. From 1 April 2016 (free entry). Full display of sundials on show. Visit the display at your convenience. Telephone the nursery on 0131 445 4698 to check on opening hours, Monday to Saturday, Sunday in summer only. Lothianburn, EH10 7DZ Midlothian, Scotland, UK. Ring Macmillan Hunter Sundials on 0131 468 2616 if you wish to meet us at Damhead so you can ask questions and discuss the different designs. Inverewe Garden. January – December (ticket entry). Single sundial. National Trust for Scotland, Poolewe, IV22 2LG Ross-shire. Telephone 0844 493 2225. Lost Gallery. January – December (free entry). Single sundial. Strathdon, AB36 8UJ Aberdeenshire. Telephone 019756 51287. The Savill Garden. 1 September – 31 October 2015 (ticket entry). Known as Britain’s finest ornamental garden, and a true wonder. 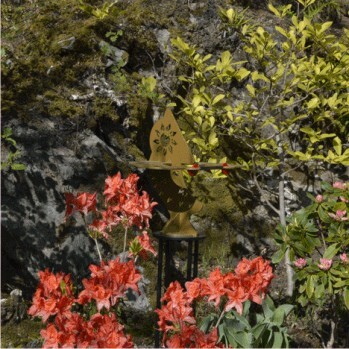 Macmillan Hunter’s latest sundial piece DIHELION was at ‘Sculpture in the Garden‘, an exciting exhibition of imaginative and innovative sculpture inspired by the natural world. All pieces for sale. The Savill Garden, Wick Lane, Englefield Green, EGHAM, TW20 0UU. 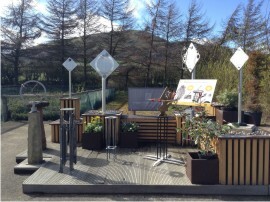 Yesterday, Sunday 23 November, we took down our last display for 2014, the Orbit sundial which has been at Caol Ruadh Sculpture Park in the West of Scotland since May. It was still in perfect condition. The weather was beautiful with a fabulous view down the Kyles of Bute.